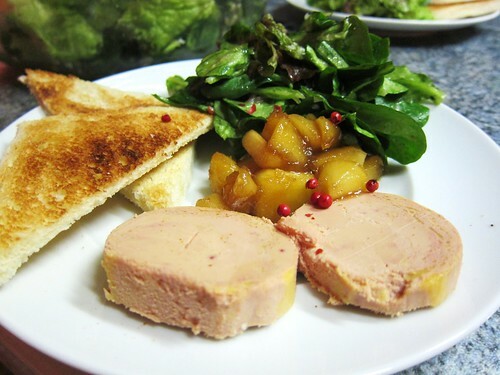 Goose Foie Gras Toast / Apples with Soy Sauce and Honey / Mâche Salad – The soy sauce works well in this composition since it elevates the flavour of the Foie. 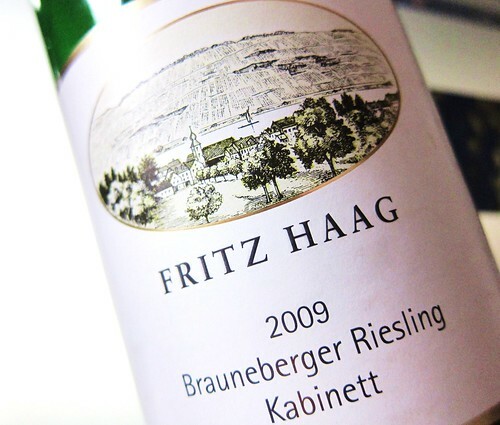 The Kabinett Riesling was probably a bit too spritzy for the Foie. A more settled Auslese or BA would have been the optimal choice. 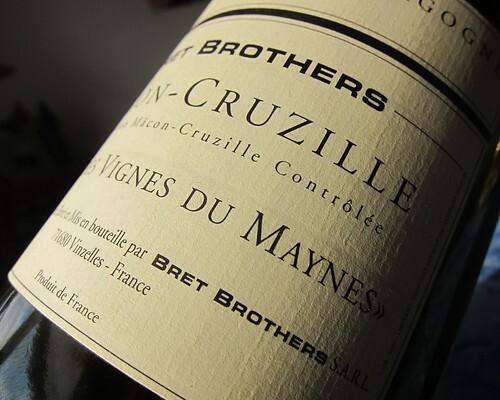 2007 Mâcon-Cruzille “Clos des Vignes du Maynes”, Bret Brothers – We took a first sip just after pulling the cork in the afternoon. Nice smokiness, a good acidity and nice butter touch from barrel ageing. Clean as a whistle on the palate, crisp green Apple notes, slight nuttiness, butter and a very long finish. Very good balance of fruit and acidity. A super-satisfying wine for my taste! Maybe the wine of the night. 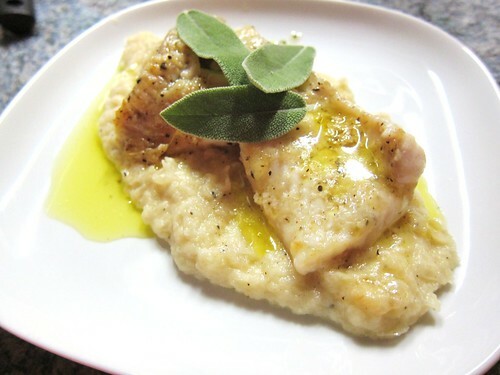 Sole Fillets / Sage Butter / Salsify Cream – Doesn’t look very photogenic I have to admit, but was quite succulent. The slight sweetness of the Salsify not only worked nicely with the sage butter and tender sole with lemon zest but also with the acidity of the Chardonnay that cut through it. Nice pairing! 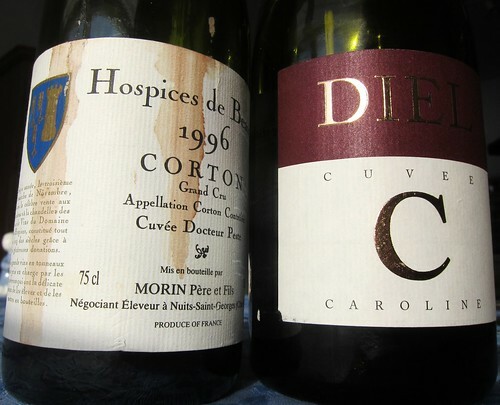 1996 Hospices de Beaune Corton Grand Cru, Cuvée du Dr. Peste, Morin Père et Fils – A wine I bought on Ebay a few years back. Got it below market price because of a stained label: something that doesn’t bother me much, content is much more important. We uncorked it in the afternoon already for a first test-sip. : brick-red it was with a slight brown hue. Scents of Underwood and very shy fruit, not bad, but we were hoping for improvement and left the wine audouzing. 1996 wasn’t a huge year in Burgundy but still a fairly good one according to vintage charts – that was basically my justification for buying it back then. The wine didn’t change much until dinner-time, then appearing balanced and charming, not without strength, but it was understated. The underwood scents were on the fore, still very shy berry fruit and a decent mineral aftertaste with quite some freshness. In the end the wine rather was a disappointment since I’d expected a bit more complexity from a Grand Cru Burgundy. For about 60 Euro one could expect that a wine justifies its reputation, right? 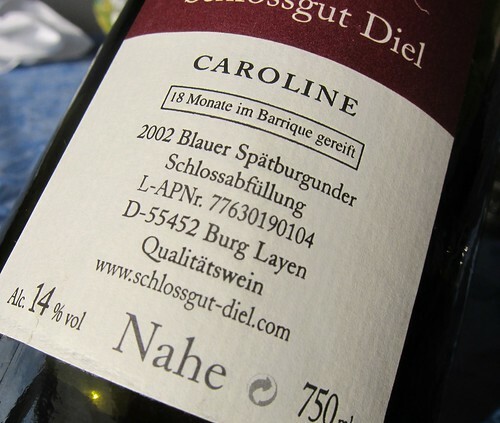 2002 Cuvée Caroline, Schlossgut Diel, Nahe. After French Pinot, now the German counterpart. We uncorked both bottles at the same time and strangely the younger Diel looked much older than its cousin with a strong brown touch and also a nose that was rather reminiscent of a dying wine. We still hoped for the miracle of audouzing. 5 hours later, what a difference! A rather youthful and powerful wild cherry nose instead of cemetery dust. 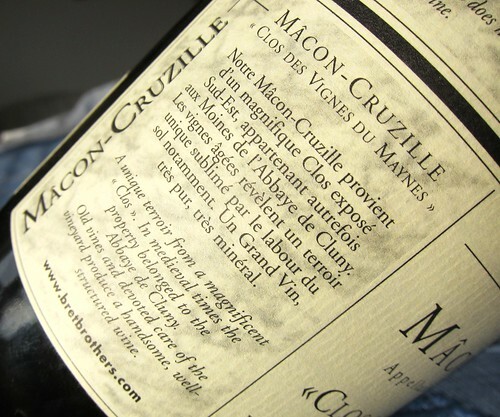 And what a presence on the palate: a powerful structure with good acidity and fresh tannins that linger on in a 30 second finish with lasting minerality. Just captivating, despite a besetting age note that wouldn’t go away. But next to the age-note, there were also cherries mixed with mushrooms and underwood scents. The wine evolved: a day later the nose had an unusual dill and Monchéri (chocolates filled with cherry liqueur) aroma-profile, somehow drawing a picture of understated spiciness. Dill also made its appearance on the palate which was an interesting component with the powerful structure and the still present cherries. Somehow though, the wine wasn’t a crowd pleaser with my family, probably because of the prominent strucure which pushed the aromatics a bit to the back. For my own taste, the wine met the expectations I had, being a quite different German Pinot than the ones I know. But still, it didn’t fullfill the role of the “Über-Spätburgunder” that many credited it with. 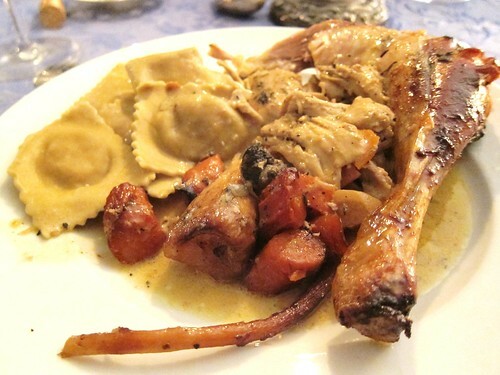 Chapon des Landes (French Capon) / Truffle Butter and White Port Cream Sauce / Ceps Ravioli – This castrated rooster tasted way better than it looks on the picture. The red wines didn’t interact as well with the cream sauce as I’d hoped. Red meat with a stronger sauce would have suited ’em better. On the next day I tried some leftovers with the Mâcon: a dream team! Of course, I hope that all readers and bogging colleagues had an equally tasty Christmas and I wish you all the best for the New Year. Sounds pretty tasty! We tried a chapon in the oven this year but it was a complete failure :( Any tips? Well, I didn’t follow any recipe. I put the Chapon first on each side for about 10-15 minutes on high temperature and then on back and breast for about 2 hours but with low temperature, of about 100 °C. Also I smeared some truffle butter under the skin to keep the meat moist. Dunno what was the most important, but the meat turned out tender and juicy!